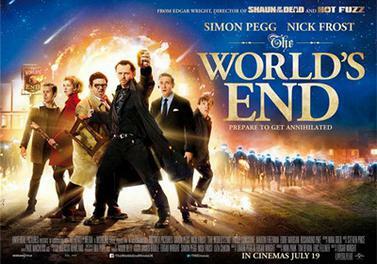 I'm sure many of us have heard of the final instalment of Edgar Wright's Cornetto Trilogy called 'The World's End' in which a group of friends come together again to attempt to complete an epic pub crawl in their home town which involves visiting twelve pubs and drinking twelve pints and concluding their night at a pub called 'The World's End'. However, this is not a review of the film, and if you wish to read my thoughts on this particular production you can do so on IMDB. So, you may ask, how does this film relate to this particular post? Well, after watching this rather amusing story of five men's attempt to complete was is called 'The Golden Mile' I remembered that Adelaide has a pub called 'the World's End' (or more precisely 'The Worldsend') so one day I decided to try and work out how I could replicate the Golden Mile in the sleepy little town of Adelaide. As it turns out, the centre of Adelaide is referred to as 'The Square Mile' (though using Google Maps I realised that the city centre is actually larger an a square mile) and after picking twelve pubs and plugging the route into Google Maps I discovered that it was pretty close to a mile (though more recent calculations using Google puts it at 3.6 km, which is well over a mile, though the length of North Terrace, according to Google Maps, comes in at 2.6 kilometers - however let us dispense with all of these semantics and simply call it 'The Golden Mile'). So, when I arrived in Adelaide I gave a friend a call and asked him if he wanted to visit 12 pubs in one night and finish off at the Worldsend, to which he replied "I don't think so". So I then suggested that we go to a nearby pub and have some lunch (beef schnitzel with pepper gravy of course), watch a movie (The World's End) and then go and visit 12 pubs, finishing of at the Worldsend, to which he agreed (I'm not really sure what caused him to change his mind - maybe it was my persistent pestering). So, after watching The World's End, we jumped onto a bus and began out epic pub crawl. However, before I go on, I would be negligent if I did not make a statement about the responsible consumption of alcohol. I wish to point out that we did NOT visit twelve pubs and drink twelve pints (I certainly would not have been able to make it to the end if that was the case) simply because I really don't drink to get drunk - I drink because I like beer, and when I go out and drink beer I generally want to be able to make my way home in one piece at the end of the night. Mind you, while I may believe in the responsible consumption of alcohol, I sometimes wonder if the pubs in Adelaide are with the same mind. The reason I say that is because at a lot of the pubs I visited when I ordered a schooner (the smallest size, and they go by different names depending on where you are - unless you are in Germany because the smallest size there happens to be a pint - Sie Sind in Deutschland, das ist eine kliene bier!) they would respond by saying "but a pint is cheaper" - so much for the responsible service of alcohol. Anyway, enough of that because you are probably more interested in the pubs as opposed so some moral discussion on the consumption of alcohol. However, I should also mention that since Adelaide has one of the largest concentration of pubs in the city centre, a number of them has struggled to survive, and unfortunately one of the pubs on this list has succumbed to that fate. Located at the corner of East and North Terrace, this was the start of our trek. Okay, it's probably not the best pub in Adelaide (though there certainly are worse) but it seems to have been progressively been going downhill ever since the first time I was dragged here by some friends and set up with some unknown woman in the nightclub. They used to have a really cool bar out the back with another, hidden, bar attached to it. I say that because when I was here with some friends having a drink we would watch people go behind a curtain and not come out. While we were wondering what had happened to them one of us decided to take the plunge and look behind the curtain himself, and when he didn't come out we became a little worried. It turned out to be okay because it was just another bar hidden away from the rest of the pub. Oh, I should also mention that there is a painting of my all time favourite dictator on the wall - Napoleon. Apparently this is was voted as Adelaide's worst vegetarian restaurant, at least that is what the banner that hung from the balcony stated. While I wasn't there, I've heard that they changed the banner to say 'Now we serve vegetarians'. Well, from what I gather, if you are a vegetarian then this is not the place to visit. Apparently even if you order a chicken salad everybody looks at you as if you were strange. I have been here for a meal once, but I can't remember what I ordered - most likely it was steak because that is what they claim they specialise in (and I can't even tell you if it is any good). However, what I do remember is that I wanted to go into the nightclub for a dance but they wouldn't let me in because I wasn't dressed appropriately, which is when I grabbed one of my female friends and gave it another shot - and it worked! So, it is true, if you are with an attractive woman, it doesn't matter how you are dressed, you can get into anywhere (unless, of course, you are wearing nothing but underpants). I had never heard of this place until a friend of my gave me a call one night and asked me if I wanted to come out and have some drinks with some friends. Well, that couple of drinks turned out to be a night that lasted until the first train in the morning when we watched the last of our group head off home. However, that night left this place permanently embedded in my mind. At later times I returned to discover a rip-roaring night club going on, but that has long since gone. Still, I quite like this place because the beer garden out the back will forever remind me of that first night I came here. Fortunately for me, I have never been barred from this pub, which meant that I didn't end up grabbing a mostly unfinished drink from a table outside - something that I wouldn't do in any case. Now this pub holds lots of memories because there was a time when I would pretty much spend every Saturday night sitting at the bar with my friend drinking beer and talking about absolutely nothing. This place has a vibe all of its own and everybody seems to accept you for who you are (though you won't find any people in suits here - actually, you probably will because the Cranker is that type of pub). I even remember sitting at one of the tables late one night when guys would come past trying to sell us various different things (or looking to buy stuff). Mind you, I was put off this place for a while, but that was probably because I had spent way too much time here, but now, all I can say is 'the good old Crown and Anchor'. Fortunately for me, when I went into the toilet in this pub I didn't get into a fight with a teenager resulting in a bunch of alien robots charging after me. Well, so far it seems like all of the pubs that I have visited hold some special memory for me, and the Exeter is no exception. Okay, not all of them are good, but that is not the pub's fault because the pub has always been good to me (except for the fact that it can be nigh impossible to find a seat at times). Okay, it may not be the Cranker, but it still has that same vibe that the Cranker (that is the Crown and Anchor) has, though it tends to be a lot more crowded than the former place. They even have this beer garden out the back, which once again becomes really crowded and can be very hard finding a seat. Still, this is one of 'The Pubs' in Adelaide. Well, as you can see from the photo above, this place is pretty much jammed packed full of people, so once again, good luck finding a seat. Actually that is not as big a problem as it appears to be because I have always managed to find a seat in one of the bars around the side where the pool tables are located, which is funny because I would have expected that to be the more popular part of the bar. They used to have a beer garden as well where live bands would play, that is until the developers moved in and threw some apartments up nearby. They still have live bands, but this time inside. This used to be one of my favourite pubs in Adelaide, if only because it was next to the bus stop that I used to get home. However things appear to have changed in the years since I would sit outside on the benches having a quiet beer and reading my book. I remember coming here and having a beef schnitzel for my farewell work lunch, however when I returned a year later all of the sudden those schnitzel's had vanished - it was now a gastro-pub. I guess this place will still hold some fond memories, even though the cheap beers and pub grub has gone. Oh, and standing on the balcony people watching was one of the great things that we would do back in those days. Oh, and we didn't get into a fight with some robots masquerading as a couple of girls we knew from our younger days, which is always a good thing. I wonder why they decided to change the name from the Marakesh to the James Place hotel - maybe because they wanted it to reflect more on its location. However, I preferred the old name because it gave this little pub hidden on one of Adelaide's side alleys a character all of its own. I still find this place a nice, quiet little place to visit, with a small bar up on the second story (ignoring the pokie machines on ground floor) where I would occasionally stop by and have a beer after work. I still remember the time when we landed up here late at night after were had been kicked out of the other pub we were frequenting (namely because it was closing) and then spending the rest of the night sitting at the table in a smoke filled haze. Unfortunately for us there was no marmalade sandwich here that night. Well, maybe this is no longer the pub that we would spend the last friday night of the school term playing pool and drinking beer, but it is still one of those pubs that hold good memories. These days it is a restaurant that offers decently priced food, and at night (or at least on Friday and Saturday nights) it transforms itself into a nightclub. The problem is that it tends to be one of those teenie nightclubs where high school students attempt to sneak in with their fake IDs. Even thought I am much older than the main patrons in this pub, I still have had some good nights sitting in the booths, or even getting out and partying on the dance floor. Mind you, the night I came past here with my friend the pub was closed for a private function, so unfortunately I had to skip this one, however I made it up by visiting another bar that had recently opened on Hindley Street. This can be a funny pub at times because late at night they close the bar off to all us regular people and only have people working 'in the industry' come in and have a drink. I do remember one night hanging around with one of those guys and it is amazing some of the doors that he managed to open for us, especially getting us into pubs that we normally wouldn't be able to get into. I've even had a friend get kicked out of this place, though it is still beyond me what he actually did. However, this place has had a bit of a make over in recent years and was incredibly crowded when we arrived. Still we managed to find a seat. Hey, the beer garden out the back was pretty cool. Fortunately I didn't run into one of my high school principles, which is always a good thing because I really didn't want to have another lecture on how I had mucked up my life (yes, I know, that was supposed to be in pub number nine, but remember The London Tavern was closed, so technically this was a ninth pub we visited - such is life). This is that sort of pub: a magnate for the student crowd who come here for cheap beer, cheap food, and live bands. Hey, I really like this place - I always have because of the culture that has developed here. Inside there are a number of nice comfy places to sit, but it is the beer garden that I love the most. I is large, it is where the bands play, and even has a massive Buddha head in the centre. I've even been here for a couple of work functions, and have always found myself downstairs in the beer garden as the night began to wind down - great pub. Oh, and still no alien robots, or at least they weren't making themselves known (probably because I hadn't picked a fight with any of them). And here we have it - the final pub of the night and the one at the end of the 'Epic Pub Crawl'. I've been here before so I wasn't expecting all that much, however, as it turned out this was a pretty epic pub. They had certainly changed a lot since I was last here with the addition of a beer garden, a balcony looking over the said beer garden, and a live rock band thundering away. What was even better was when I arrived here with my friend, the balcony (as small as it was) was empty which meant that we had an awesome view of the band below and we were not having to deal with trying to find a seat (because there was only one table, and a ledge running along the balustrade). So, despite not running into any aliens, nor finding ourselves in an alien spaceship hidden under the pub after pulling the wrong beer tap, this was still an epic night (though not one worthy of a movie by Edgar Wright). However, since the night finished off with a live rock band, I'll finish this post off with Def Leppard playing 'Pour Some Sugar on Me' live in Denver Colorado. Not surprisingly, this post also appears on my travel blog. 12 pubs (but skipping the 12 pints) - Adelaide's Golden Mile by David Sarkies is licensed under a Creative Commons Attribution-NonCommercial-NoDerivatives 4.0 International License. All images on this post are © and/or ™ their relevant owners. If you are the owner of any of the images used on this website and wish them to be removed then please contact me. World's End Poster: Source Wikipedia used under the fair use provisions to provide an illustration as to the film to which is being referred.